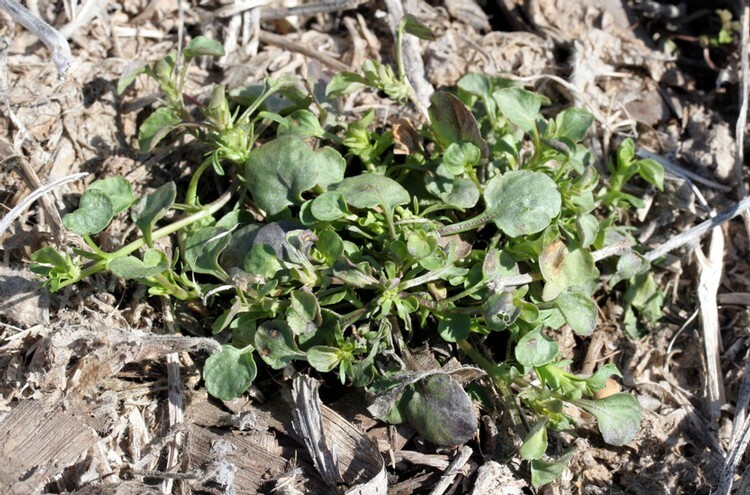 Usually a winter annual weed of winter small grains, nurseries, and landscapes Field violet ranges from 4 to 12 inches in height and has attractive yellow and purple flowers. It is found throughout the northern half of the United States and sporadically into the southeastern and southwestern states. Cotyledons are oval in outline, only 3 to 5 mm long and 3 to 4 mm wide, and occur on petioles. Subsequent leaves occur alternately but develop as a basal rosette. The first true leaves and subsequent leaves are oval to spatula-shaped in outline with rounded teeth along the margins. Oval to spatula-shaped in outline with round teeth along the margin. Basal leaves are approximately 3/4 to 1 1/2 inches long and almost as wide. Leaves occur on petioles and are arranged alternately, although they initially develop as a rosette so this is often difficult to determine. Leaves are mostly without hairs except for along the veins on the leaf undersides. Upper leaves that occur along the flowering stem are much more linear in outline, ranging from 3/4 to 3 inches long and about 1/2 inch wide. Stipules occur at the base of the leaf petioles in the upper portions of the flowering stem, and these stipules are divided into 5 to 9 linear segments. Reaching as much as 12 inches in height but typically no more than 8 or 9. Stems are erect, branched or unbranched. Occur on long flower stalks (peduncles) that arise from the area between the leaf petioles and the stem (leaf axils). Individual flowers are typically 1/2 inch in length and width, and consist of 5 petals that are white to yellow in color, usually with some purple markings or purple tinges. Four smaller petals occur above one larger petal. Many flowers occur on a single plant. A round capsule approximately 5 to 10 mm long. Fibrous root system. When crushed, the roots of this weed often emit a wintergreen-type odor. 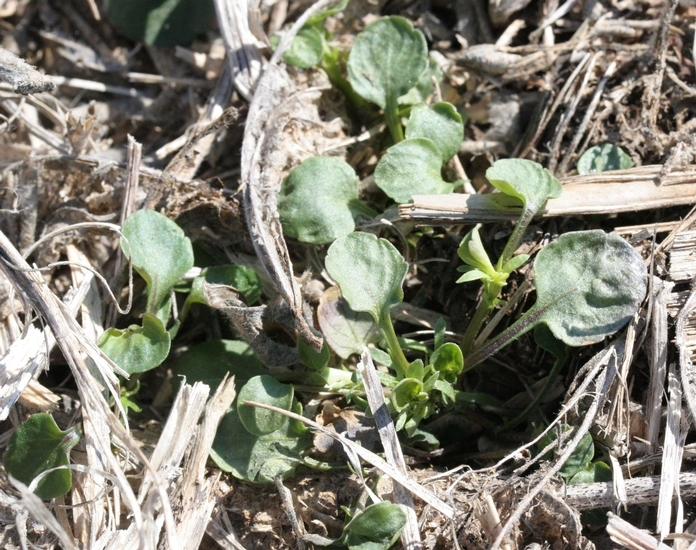 The winter annual growth habit, leaves with round teeth along the margin, and the typical violet-like flowers are all characteristics that help in the identification of field violet. 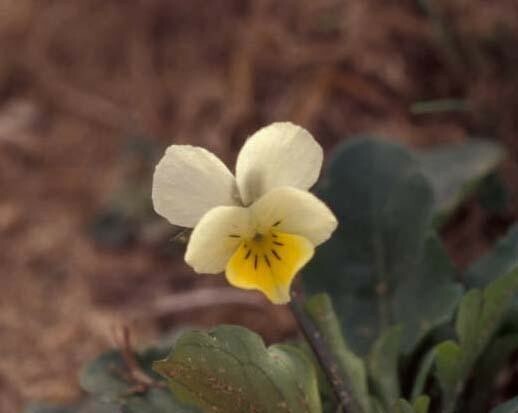 Field pansy (Viola rafinesquii) is very similar in appearance to field violet, however field pansy has leaves that usually lack hairs completely and has flower petals that are about 3 times as long as the sepals. 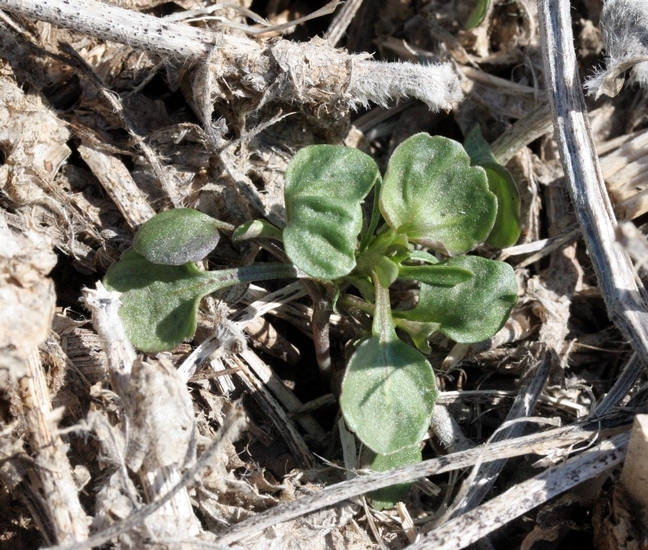 In contrast, field violet usually has leaves with hairs along the veins on the leaf undersides and has flower petals that are about the same length as or shorter than the sepals.